Caponata is a Sicilian antipasto dish made primarily from tomatoes, eggplant, onions and various other vegetables cooked in olive oil. It’s traditionally served at room temperature alongside salads, fish, or on its own as a relish. The ingredients tend to vary from cook to cook and region to region; it is often a mish-mosh of ingredients from the produce drawer. There is an unusual version called Caponata San Bernardo that combines eggplant with a sauce of dark chocolate, toasted breadcrumbs, almonds, sugar, vinegar, and sometimes even anchovies! Originally caponata was made with squid, celery and eggplant topped with a sweet and sour sauce. It was served in the shops and taverns around Sicily’s ports, where it may have derived its name from the Latin word for tavern, caupo. It is also believed to have Spanish origins, possibly gaining its name from the Catalan word caponada and first appearing in the Sicilian vocabulary around 1709. 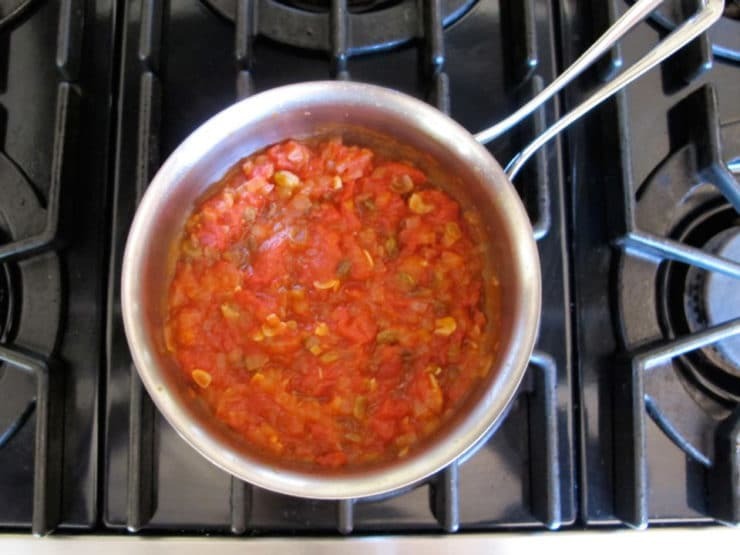 The root of the word caponada is capón, related to capón de galera, a gazpacho-like dish similar to caponata that was served aboard ships. Some gastronomes believe that it may have been a mariner’s breakfast due to the large amounts of preserving vinegar used, which would allow it the long shelf life necessary for an ocean voyage. One characteristic trait of caponata is that they are always sweet and pungent, a strongly flavored counterpoint to other dishes on the table. A good caponata is sweet, tart, spicy and complex with layers of flavor. 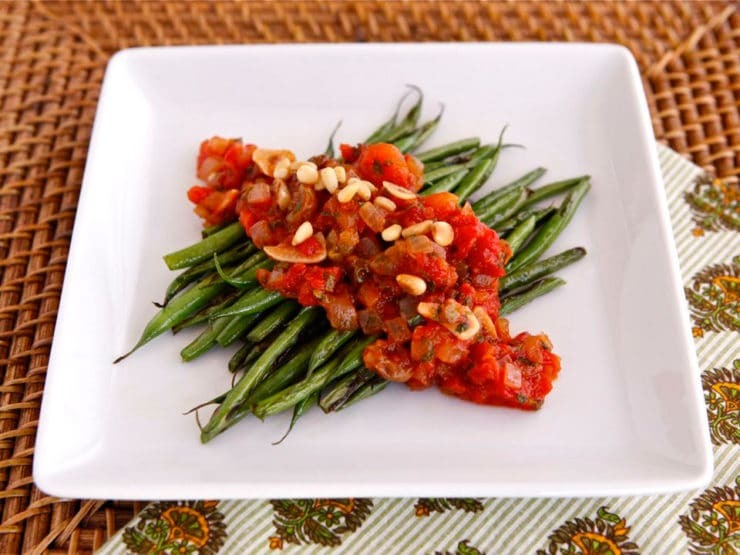 Which brings us to my latest side dish recipe, Caponata-Style Green Beans. I feel like green beans can be somewhat boring, unless you know just how to dress them up. Here I’ve pan-seared young, thin green beans till just tender, then topped them with a simple, Italian-inspired caponata sauce. Most caponatas include eggplant, but in this version tomatoes take center stage, providing a saucy accent to the green beans. This dish is great for the holidays because you can make the caponata ahead—in fact, it will taste better after a night in the fridge. The sweetness of the caponata makes it suitable for the Rosh Hashanah table. Pan-searing the green beans only takes a few minutes (be sure to use young thin beans, not the thicker ones), and you can warm up the sauce just before serving. Serve the delicate green beans topped with warm caponata for an elegant presentation. A sprinkling of toasted pine nuts completes the dish; if you have a nut allergy or are watching your budget, you may omit them. The caponata can also be used as a topping for fish, crackers, or to make a delicious mozarella crostini… there are so many possibilities! Have you ever tried caponata? 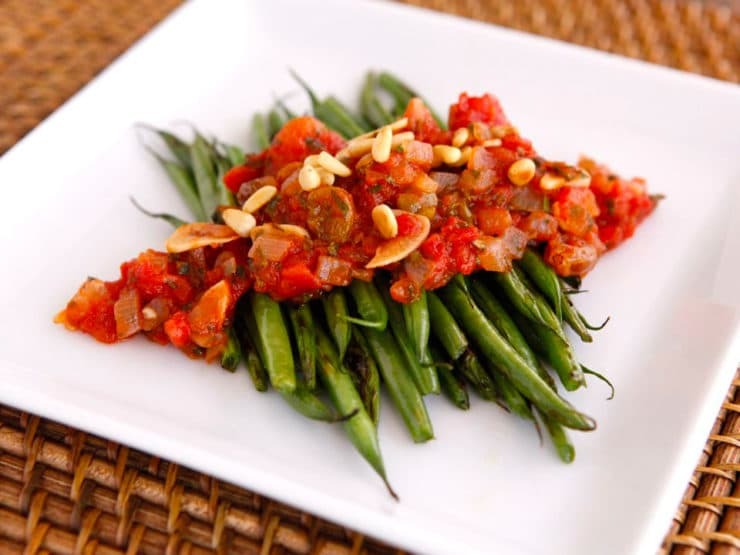 Sautéed green beans topped with an Italian-inspired caponata sauce and toasted pine nuts. 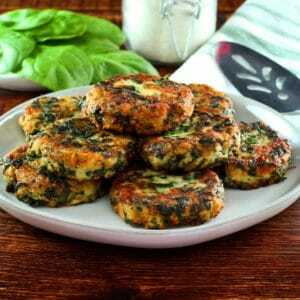 Tasty vegetarian side dish. Rosh Hashanah recipe. Wash and trim green beans, set aside. Peel and dice onion. Slice garlic. 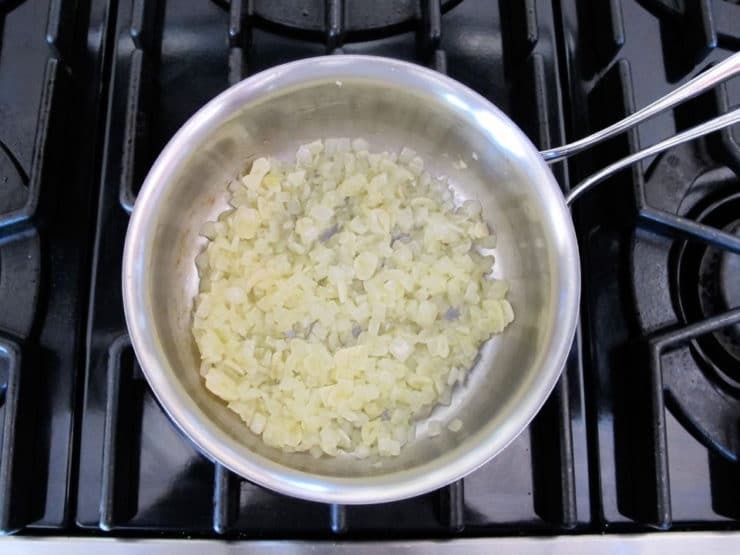 In a pan, sauté onions in 1 1/2 tbsp olive or grapeseed oil. Cook until soft and slightly translucent. Add the garlic and continue to cook till fragrant; don't let the garlic burn. Add canned tomatoes, vinegar, raisins, honey, crushed red pepper and a pinch of salt. Stir. Cook down until most of the liquid has been reduced, about 15-20 minutes. Stir in the oregano and parsley. Remove from heat. Heat a sauté pan over medium high heat. Once hot add green beans, 1 ½ tbsp olive or grapeseed oil and a pinch of salt. Cook the beans for a few minutes, stirring frequently, until tender crisp. They should be bright green with a lightly charred exterior and be tender, but not soft. Transfer to a serving plate. 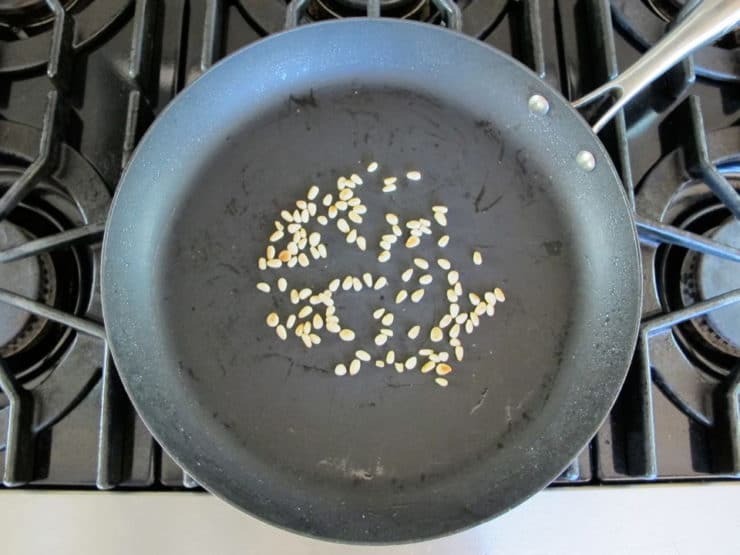 Using the same pan you used to cook the green beans, toast pine nuts over medium heat until lightly toasted and golden. Spoon caponata topping over the cooked green beans. Garnish with toasted pine nuts. Herbst, Sharon Tyler (2001). The New Food Lover’s Companion. Barron’s Educational Series, Inc. Hauppauge, NY. Piras, Claudia (2010). Culinaria Italy: Country. Cuisine. Culture. h.f. ullman, Potsdam, Germany. Clifford A. Wright: A History of Sicilian Caponata. Interesting! an impressive dish to serve when we have company for a Shabbat meal – Thanks! The Caponata Style Green Beans are simply divine. I made it for Rosh Hashana and I am getting ready to make it again for Succos when I will be having my guests. This is one of the nicest recipes for green beans that I have so far. Thanks Tori. I made this for our Rosh Hashanah dinner and it as a big hit — and half my family is Italian! The caponata was delicious with some of my other dishes, too. I especially like it with quinoa. I will definitely make it again. 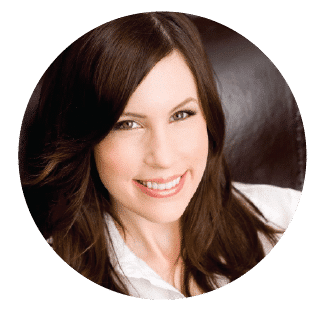 Thank you, Tori! Isn’t it great? I think it would go well with all kinds of things… on a toasted crostini, on top of zucchini, with couscous or as you said quinoa… so many possibilities. Thank you for this! It went over so well with my husbands family for our Rosh Hashanah dinner. It was even good the next day! I always trust that your recipes will be delicious. I bought some beans from the farmers market for $14 a lb. and they were worth it with your caponata. Thanks again Tori. I made this for Rosh Hashana; super taste, and beautiful on the plate. I used regular brown raisins. I think I will make it again for Succos. Thank you, thank you. Terrific Nettie! Thanks for letting me know. 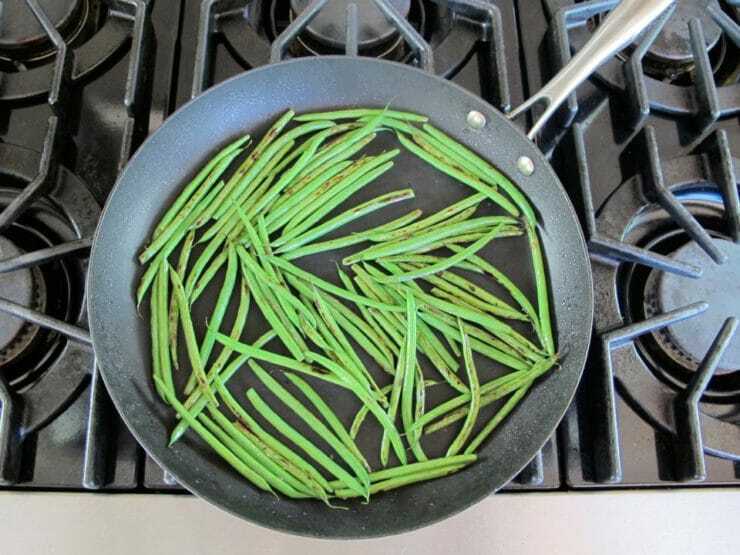 I love this dish too, it’s a great way to dress up green beans. This time of year I have wonderful tomatoes fresh from my garden. How many of them would I use in place of the canned ones in this recipe? Many thanks and Shana Tova! And Shana tova to you and yours! Used to have it in the pantry all the time but don´t see it on the grocery shelves anymore. Love Caponata, it looks pretty served over beans! 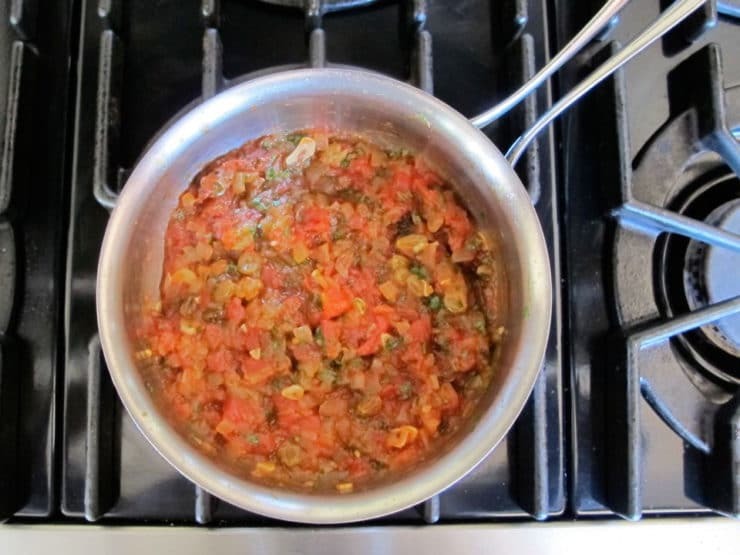 Thanks for this recipe Tori as I never come across Caponata. It looks like our sambal –chillie pounded with onion and so on. sure will try it. I wonder why the head and tail of the green beans were not peeled ? 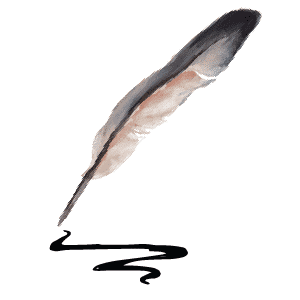 We, Malaysia often do that to remove the hard fiber and it will look prettier. I will try the Caponata as it is a healthy dish by itself, can add to any recipe or even eat with bread , pasta !! Hi Rebecca, the head and tail were not removed because these are baby green beans. They are very young and tender, so there is no need to remove the ends as you would with larger green beans. What a lovely, tasty dish. Thank you, Tori. my grandmother used to make this. Serve it on bread or crackers. I am sicilian. tried it? it is a staple good in our house. I have been eating caponata my whole life, Love it!!! 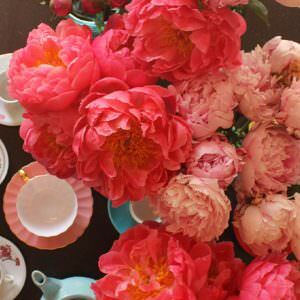 The basic recipe can be added to in so many ways. I love it with lots of eggplant, celery, zucchini, peppers even peaches. Looks good and is !!!!!!! made mine as a light supper. I am absolutely making this for Rosh Hashanna.